MEXICO CITY, May 8 2013 (IPS) - In the 2011 action-thriller “Unknown”, scientists are persecuted by the biotech industry because they plan the open release of a drought- and pest-resistant strain of maize that could help eradicate world hunger. There are certain parallels with the situation today in Mexico, the birthplace of maize, which is at the centre of the global fight to protect the crop’s diversity from the onslaught of genetically modified varieties. “It’s the first time in history that one of the most important harvests in the world is threatened in its centre of diversity,” Pat Mooney, the head of the Action Group on Erosion, Technology and Concentration (ETC Group), an international NGO, told IPS. Civil society organisations are raising their guard against the possibility that the government of conservative President Enrique Peña Nieto of the Institutional Revolutionary Party (PRI) may approve commercial cultivation of transgenic maize, a move widely condemned by environmentalists and other activists, academics, and small and medium producers due to the risks it poses. In September, the U.S. corporations Monsanto, Pioneer and Dow Agrosciences presented six applications for commercial plantations of transgenic maize on more than two million hectares in the northwestern state of Sinaloa and the northeastern state of Tamaulipas. Moreover, in January these companies and Syngenta presented 11 applications for pilot and experimental plots to grow transgenic corn on 622 hectares in the northern states of Chihuahua, Coahuila, Durango, Sinaloa and Baja California. And Monsanto has applied for an additional plantation in an unspecified area in the north of the country. Since 2009, the Mexican government has issued 177 permits for experimental plots of transgenic maize covering an area of 2,664 hectares, according to the latest figures provided by the authorities. But large-scale commercial release of GM maize has not yet been authorised. “They are going to serve up transgenic maize on every table in spite of the fact that food sovereignty depends on growing native corn,” said Evangelina Robles, a member of Red en Defensa del Maíz (Maize Defence Network) which campaigns against GM corn. “As a result, we have to demand its prohibition by the state,” she told IPS. Mexico produces 22 million tonnes of maize a year, and imports 10 million tonnes, according to the agriculture ministry. The country purchased about two million tonnes of GM maize from South Africa over the last two years, and is set to import another 150,000 tonnes. Three million maize farmers cultivate about eight million hectares in Mexico, two million of which are devoted to family farming. White maize is the main crop for human consumption, while yellow maize, for animal feed, is largely imported. The National Council for the Evaluation of Social Policy (CONEVAL) estimates the country’s annual consumption of maize at 123 kg per person, compared to a world average of 16.8 kg. The historical link with pre-Columbian indigenous cultures gives maize a strong symbolic and cultural significance throughout Mesoamerica, the area comprising southern Mexico and Central America, where it was domesticated, producing 59 landraces or native strains and 209 varieties. 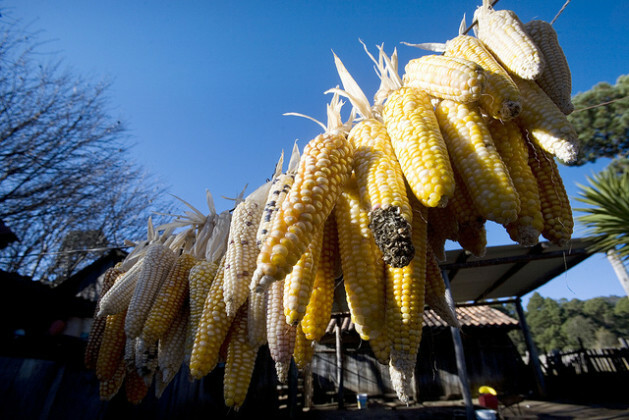 In the state of Mexico, adjacent to the capital city’s Federal District, small farmers have found their native maize to be contaminated with GM maize, according to tests carried out by students at the state Autonomous Metropolitan University. “We swapped seeds and decided to do some tests. Now we are more careful when exchanging, and over who participates in the fair, although we still have to carry out confirmation tests,” activist Sara López, of the Red Origen Volcanes (Volcanoes Origins Network), an association of small farmers that has been organising producers’ fairs since 2010, told IPS. Environmental, scientific and small farmers’ organisations have discovered GM contamination of native maize in Chihuahua, Hidalgo, Puebla and Oaxaca. Contamination is “a carefully and perversely planned strategy,” according to Camila Montecinos, from the Chile office of GRAIN, an international NGO that works to support small farmers and social movements in their struggles for community-controlled and biodiversity-based food systems. Transnational food companies “chose maize, soy and canola because of their enormous potential for contamination (by wind-pollination),” said Montecinos, one of the experts participating in the preliminary hearing on transgenic contamination of native maize at the Permanent Peoples’ Tribunal, an international opinion tribunal which opened its Mexican chapter in 2012 and will conclude with a non-binding ruling in 2014. “When contamination spreads, the companies claim that the presence of transgenic crops must be recognised and legalised,” in order to pave the way for marketing the GM seeds, to which they own the patents, she said. Mexico’s environment minister, Juan Guerra, has said that all available scientific information will be examined before a decision is made. But that will not be easy. The National Confederation of Campesinos (Small Farmers), one of the main internal movements in the ruling PRI, has had an agreement with Monsanto since 2007 under which the company is to “conserve” native varieties. Meanwhile, the Peña Nieto government still has not approved regulations for the format and contents of reports on the results of releasing GM organisms, and the possible threats to the environment, biodiversity, and the health of animals, plants and fish. “For 18 years, corporations have been unsuccessful in convincing the people that their products are good. Maize is being used as a means of political and economic control. People need maize to be alive,” the ETC Group’s Mooney said. The transgenic seeds on the market are herbicide-resistant Roundup Ready and Bt (for the Bacillus thuringiensis gene they carry for pest resistance) versions of cotton, maize, soy and canola. While they are legally grown in Canada, the United States, Argentina, Brazil and Spain, they are banned for example in China, Russia and the majority of the EU countries. Recent studies published in the United States show that transgenic crops do not significantly increase yield per hectare, do not reduce herbicide use, and do not increase resistance to pests, in contrast to biotech industry claims. “We are analysing what legal action to take against the new applications (to plant GM maize),” said Robles, of the Maize Defence Network. Don’t let them do this, Mexico. Corn – real corn – is your birthright, your history, your culture. Do you really want to use your children as guinea pigs for Monsanto? When GMOs are fed to animals, the 3rd generation becomes sterile. If the same holds true for people, then I’d call that genocide. ЧУШЬ СОБАЧЬЯ , ЧТО ГМО ПОМОЖЕТ. ОНА ПОМОЖЕТ ТОЛЬКО ВЫРОЖДЕНИЮ ЧЕЛОВЕЧЕСТВА. ЗАХОДИТЕ НА САЙТ irina-efremova.ru ТАМ ПРАВДА.